Want to know what safe foods for rats are? If so, take a look at this article. We’ve done some investigation on how to know what foods your rats can safely have. From the smallest of the rodents to the largest of the canines, all pets love treats. But how do we know what is safe to give them and what is dangerous? For more common house pets such as cats and dogs, the nutritional rules may be more universally known. But for more exotic pets like the intelligent, albeit tiny rat, the lines may be a bit more blurred. Like most pets, rats are unique and have specific dietary needs. What do rats eat? What can rats eat? In today’s article, we hope to help you navigate your rat’s most prominent dietary needs as well as provide you with a list of what you can feed him and what you should stay away from. 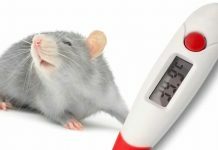 What Are The Dietary Needs of Rats? 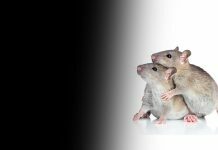 Rats, like most living creatures, have specific dietary needs that play a vital role in their longevity, their health, and their overall happiness. Whether they are in the wild or in an enclosure, all rats need a balanced diet of vitamins and minerals, proteins, and healthy carbohydrates. So what do wild rats eat, anyway? Do rats eat meat? Did you know that rats are omnivores? Their natural diet consists of both plant-based foods and animal proteins, and that doesn’t change when they are domesticated. The best way to keep your pet rat happy and healthy is to provide him with the healthy diet he needs to thrive. Pet rats do best with commercial rat foods specifically designed for them. That means foods made for guinea pigs and rabbits simply won’t do. Rat food is created to meet all the nutritional needs of these plant and meat-eating critters. You can learn more about pet rats by clicking here. Can Rats Eat Human Foods? While we recommend implementing a high-quality commercial rat food into your rat’s daily diet, there are also some human foods your pet rat will not only enjoy but can help to add a healthy variation to their everyday meals! Many human foods are an excellent source of vitamins, minerals, and protein. They should be implemented into your rat’s day-to-day food intake. Here Are 25 Foods That Are Safe for Your Pet Rat! Here’s a list of 25 safe foods.Click on each one to find out more! Dogs should stay away from grapes – but rats, on the other hand, will thoroughly enjoy them! In fact, purple grapes especially have even been said to have anti-carcinogenic properties. They can actually help to reduce the chances of your rat developing cancer. However, we should keep in mind that, like most fruits, grapes are a high source of sugar. An excessive amount can cause digestive issues in your rat, such as diarrhea. Can rats eat raisins? Only in very small amounts, as these treats have a lot of concentrated sugar. As long as they are not green! Feeding your rat an unripe banana can cause harmful digestive problems. However, yellow or browning bananas are just fine and can be an excellent source of vitamins for your rat. Still, since bananas are high in sugar and fat, they should not be implemented as a primary food source and should only be given as an occasional treat. 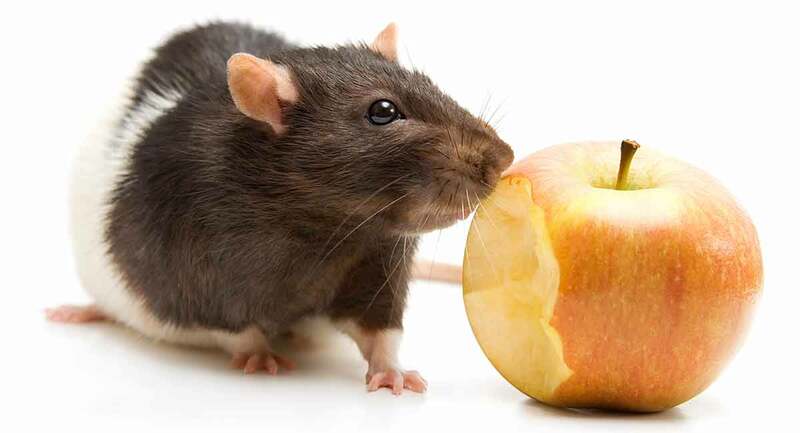 Apples can add a delightful bit of diversity to your rat’s diet. Avoid the core and seeds and offer him small slices a few times a week to give him a tasty, juicy treat he’ll love! Can rats eat pears? What about other fruits? Watery fruits, such as pears, peaches, and kiwis, can also be safe. These are actually a great source of potassium, vitamin K, and vitamin C, as well as cancer-fighting phytochemicals. So yes, they can! But just remember, rats may not like the skin, and they might make a mess. Can rats eat cherries? Can rats eat strawberries? Can rats eat blueberries? A number of other berries such as raspberries and blackberries are also safe for rats and serve as wonderful treats. Still, remember that like most fruits, berries are a natural source of sugar. They should, therefore, be given in limited doses and you should remove any pits. Plums are chock full of vitamins, including vitamin C.
Vitamin C is an essential vitamin responsible for healthy tissue development in not only humans but rats as well! Can rats eat watermelon? Can rats eat other melons? Rats love juicy fruits like melons. Give them a small slice a few times a week to reward them for good behavior, or simply to show them you care. Some of a rat’s favorite melons include honeydew, cantaloupe, and seedless watermelon. These acidic fruits are high in sugar. So while they are safe, they should be fed in moderation. Can rats eat broccoli? Can rats eat cucumber? Can rats eat avocado? Break out the broccoli, zucchini, asparagus, kale, avocado, and cucumber. Green veggies like the ones listed above are an excellent source of fiber, vitamins, minerals, fatty acids, and protein. Avocado is great for rats that need to gain weight quickly. Just avoid seeds, rind, and leaves. Note that asparagus, broccoli, and cauliflower can give rats gas, so feed sparingly. Rats will love munching on these healthy green snacks. But see the list below for greens to avoid – spinach and celery! Potatoes are a fat-free, sodium free, cholesterol free source of vitamins C and B6. They are also excellent sources of fiber, magnesium, and antioxidants that will help to keep your rat happy and thriving. However, you should avoid potatoes that have turned green as they contain solanine, a toxic chemical that can cause digestive issues in rats. Also, be sure to peel and dice your potatoes. Only give your rat the meat of the potato. Never give your rat the potato eyes, which are the potato endpoints. Can rats eat sweet potatoes? Can rats eat carrots and other tubers? Like russet potatoes, cooked sweet potatoes are a fabulous source of vitamins and minerals. Avoid giving your rat uncooked sweet potatoes, however, as they can prove toxic. What about other tubers? Can rats eat carrots? Can they have rutabaga and parsnips? Yes, in small amounts. Tubers can be good for their nutritional value and because they have less sugar and water than other fruits and vegetables. Cooked squash is a healthy veggie your rat will love. Carrots can be eaten raw. Can rats eat pasta and bread? Cooked and dried pastas are a tasty treat and a great source of carbs, which rats actually need in their diet to flourish. Rats will especially enjoy dried pasta as they can gnaw on it a bit more. Can rats eat bread? Whole-grain breads and pastas are safe for rats to eat especially if softened with milk, but don’t allow them much, as it can give them gastrointestinal issues. Rats love pumpkin, so feel free to incorporate it into your pet rat’s diet every once in a while. Be careful, though, as pumpkin seeds are very high in fat. While rats can eat the seeds, we suggest you give your rat pumpkin seeds in moderation. While rats can have white or brown rice, we suggest brown rice. Popsicles aren’t just a fun summer treat for us! Rats too enjoy these icy delights, especially when it’s warm outside. Remember, popsicles are typically a high source of sugar and artificial flavoring, so give only give bits of popsicle to your rat in small doses. You can also seek out the lower fat, sugar-free variety. Of course, we’re talking about sweet red, yellow, and green peppers, not spicy! Give your rats small slices at a time and watch him much away on these colorful, juicy, tasty veggies! Everyone knows that rats love cheese! This includes cottage cheese. However, we suggest cheese in smaller quantities and on only on occasion. The healthiest options for your rat are cheeses that are soy-based. Avoid blue cheese, as the mold can be toxic to your rat. As previously mentioned, rats are omnivores. This means they require both meat and plant-based foods. Thoroughly cooked meats such as liver, beef, chicken, turkey, and ham are excellent sources of protein. Chicken and liver are the healthiest options for your rat. Small amounts of turkey, ham, and beef are fine too. Can rats eat saltine crackers? Since rats like to chew, saltine crackers are a fine snack for them. However, only give saltine crackers occasionally, as they are high in salt, Too much sodium will make your rat sick. Yogurt can play a wonderful role in keeping your rat’s digestive system healthy. Plain yogurt with low sugar and live active cultures are the healthiest. Protein is an essential part of a rat’s diet. Scrambled or hard-boiled eggs are protein-laden food rats will love! Can rats eat almonds and sunflower seeds? What about nuts and seeds? Can rats eat almonds? While nuts like almonds and sunflower seeds are fine for your rat, they are high in fats. They should only be given on occasion or as a special treat. Cheerios, Chex Mix, Corn Flakes, and other cereals low in sugar and high in carbs make delightful and healthy snacks for your pet rat. Can rats eat dog biscuits? Dogs aren’t the only one who love dog biscuits! If you are going to give your rat this doggy-style treat, we recommend small amounts, broken off if necessary. Dog biscuits are very hard, and your rat will enjoy chewing on them. Can rats eat mushrooms? Yes, in small amounts, if cooked. Cooked mushrooms can offer many health benefits to your pet rat. An occasionally cooked mushroom makes a great treat while at the same time offering a lot of nutritional value to your rat’s diet. However, not all mushrooms are safe. Only feed your rat mushrooms that are deemed safe for human consumption as well. Can rats eat uncooked beans? Uncooked beans contain hemagglutinin, an extremely toxic anti-nutrient that can harm the digestive tract in rats. 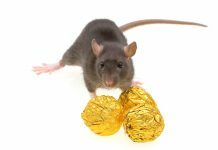 Chocolate, while a human favorite, is full of large amounts of sugar and caffeine, both of which can be toxic to rats in large doses. For this reason, chocolate should be avoided. Can rats eat poppy seeds? Poppy seeds can be fatal to rats or cause irreversible brain and nerve damage. You should be especially careful what you are feeding your pet rat, as poppy seeds are found in many tasty human foods. Just like poppy seeds, licorice has been known to cause neurological problems in pet rats. Aside from being toxic, it is also high in sugar. Can rats eat raw sweet potatoes? While cooked sweet potatoes are just fine, raw sweet potatoes can be toxic. Make sure you cook them and dice them up before giving them to your pet rat. Candy is a very high source of sugar with basically no nutritional value whatsoever. When looking for a sweet treat for your pet rat, we suggest small amounts of fruits from the list of safe foods above. Peanuts contain anti-nutrients and, like raw beans, harm your pet rat’s digestive system. For this reason, you should also avoid peanut butter. Can rats have soft drinks? Like candy, soft drinks contain high amounts of sugar and high-fructose corn syrup. Neither of these is good for your rat. Can rats have caffeinated drinks? Caffeine raises the heart rate and can cause heart attacks in small animals such as rats. For this reason, caffeine should absolutely be kept away from your pet rat. Can rats eat unripe or green bananas? As stated above, ripe bananas are a delicious treat for your rat. However, green bananas can be toxic and cause digestive issues for your pet rat. Can rats eat raw artichokes? While many veggies are great for rats, raw artichokes can harm the rat’s digestive system. Rhubarb contains oxalates, which are extremely toxic and can kill your pet rat, especially if improperly cooked. For that reason, this food is off limits. Can rats eat green potatoes? Russet potatoes are perfectly safe when ripe, but they become toxic when they are too ripe and turn green. Can rats have spinach or celery? Can rats eat spinach? The answer is no. Spinach contains high levels of oxalates, which is toxic to rats and can cause numerous health issues. Can rats eat celery? Not really! Celery has very little nutritional value, and is a known carcinogen for rats. Can rats eat moldy foods? If you think your pet rat will fare just fine eating that old piece of moldy bread, think again. Mold can be toxic to rats. This is the main reason blue cheese is such a no-no! Can rats eat wild insects? Many pet stores offer mealworms as a safe food for rats. However, insects farmed for pet consumption are very different than insects that live in the wild. Wild insects can be a source of disease and pesticides. Some even harbor parasites. Onions can make your rat sick, causing anemia and digestive problems. Some tofu can contain harmful bacteria that can be toxic to your rat. Can rats eat potato skins and eyes? While the meat of a potato is safe for your rat, the potato’s skin and eyes (the eyes being the endpoints of the potato) can be toxic to your rat and should not be given to him. If you are feeding your rat potato, be sure it is peeled and diced first. Can rats eat oranges? Can rats eat grapefruit? High-citrus foods like oranges are safe for female rats, but male rats should not eat citrus fruits. These contain high levels of D-limonene, which can cause kidney cancer in males. For this reason, we say avoid citrus foods altogether for both female and male rats. Other foods that contain D-limonene include orange peels, orange juice, mangos, black pepper, and nutmeg. So can rats eat mango? Nope. What Else Should You Know About Your Rat’s Diet? The lists above are not complete lists. Be sure you research any foods you are unsure of before offering them to your pet rat. Unlike humans, rats do not have a gag reflex and cannot throw up foods that are toxic to them. Therefore, it is of the utmost importance that you know what you are giving your rat and whether or not is healthy for him. Make sure human foods make up no more than 10-20 percent of your rat’s diet. Which ones are your rat’s favorites? Ito, M. et al (2000). Anti-ulcer effects of chitin and chitosan, healthy foods, in rats. The Japanese Journal of Pharmacology, 82(3). Miller, G. et al (1994). Rats on a macronutrient self-selection diet eat most meals from a single food cup. Appetite, 23(1). Chen, K. C. et al (2009). Evaluation of subchronic toxicity of pet food contaminated with melamine and cyanuric acid in rats. Toxicolic Pathology, 37(7). Johnson, D. F. & Collier, G. H. (1987). Caloric regulation and patterns of food choice in a patchy environment: The value and cost of alternative foods. Physiology & Behavior, 39(3). Previous articleGuinea Pig vs Rabbit – Which Makes The Best Pet?